Ryan Thompson died after being stabbed in Gregson Street, Sacriston. Pic: Google Maps. A murder suspect may face a trial by jury next year accused of stabbing a man to death. Richard Lee is alleged to have killed 25-year-old Ryan Thompson in an attack in Gregson Street, Sacriston, near Durham, on Saturday night. The 25-year-old accused appeared at Newcastle Crown Court today, via video link to HMP Durham, facing a charge of murder. He was not asked to enter a plea at the short hearing and there was no application for bail. A trial, which may last around seven days, has been provisionally listed for February 4 next year. 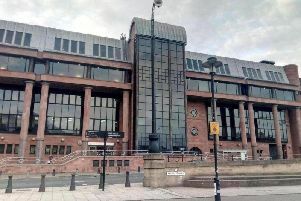 Lee, of Viola Crescent, Sacriston, County Durham, will be back in court for a further hearing on October 1, and has been remanded in custody in the meantime.